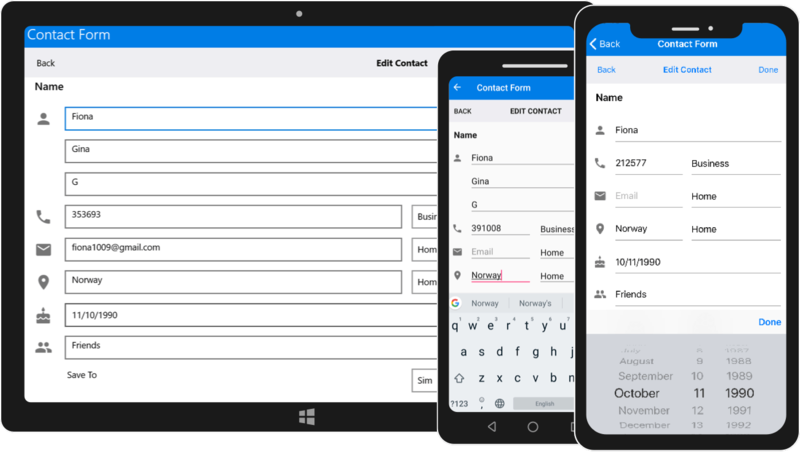 The Xamarin.Forms DataForm control provides a form-filling interface to edit the fields of the associated model (such as login or sign-up). The Xamarin.Forms DataForm Control is used to display and edit the properties of any data object using a wide range of built-in editors for different data types. Custom editors are also supported. It simplifies the development of various forms such as login, reservation, and data entry. It supports built-in data validation and data annotation. It also provides support for linear and grid layouts, label positioning options, grouping, and more features to design the UI as required. Commit mode - Editing support is provided with the following commit modes that determine when an edited value should be updated in the data object. Read-only mode - DataForm supports read-only display mode. It also allows specific fields to be made read-only. Converters - Support to show the original value in a different format or as different value using converters. Linear layout - The linear layout arranges items in a single column. Grid layout - The grid layout arranges items in a predefined number of columns. Order of the fields - You can change the order of the fields regardless of the position in the data object to view it in the desired position. Regenerate data fields - Support to add or remove fields and regenerate fields dynamically to show the fields only when required. Label position - You can position the labels to the left or at the top of the editor. Label and editor width customization - You customize the label and editor width ratio to set the width proportionally. Width and height customization - Support to customize each data field’s width and height for better readability. Watermark - Display watermarks to guide end users. Show or hide fields - Support to show or hide data form fields dynamically based on the application needs. Exclude fields - Support to exclude specific fields of a data object in UI. Image label - Display labels with images for easy comprehension. Data annotations - Options to customize data form fields based on data annotation attributes. Customization - Complete control over label and editor customization. The Xamarin.Forms DataForm supports localizing label text, group name, watermark, and validation messages in the desired language.